If you’re lucky, there should still be some wild garlic available for picking where you are. It tastes delicious in leaf salads, but I like to preserve it in a pesto so that you can have it all year round. Just store the pesto in a jar and make sure it’s sealed with a layer of oil and keep it in the fridge. It’ll last for months without spoiling. 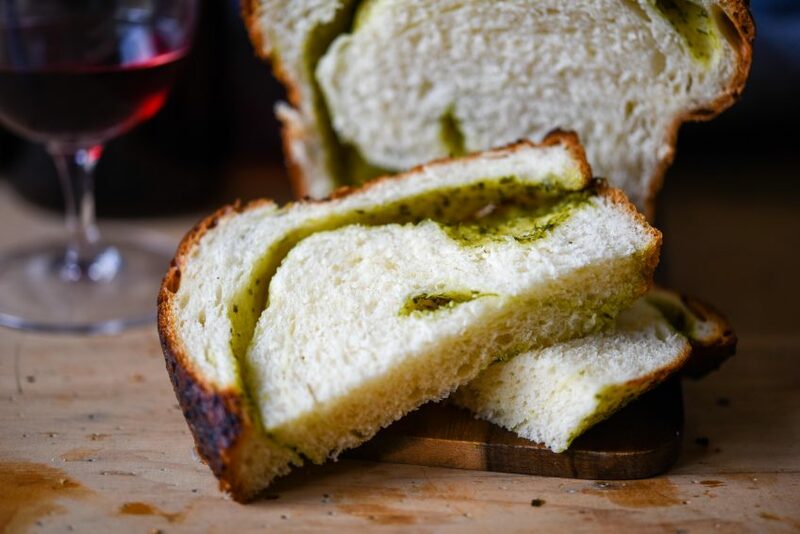 Then when you’ve made your pesto you can use it to make this wild garlic milk bread. I’ve tried lots of different recipes to make wild garlic pesto and I’ve now come up with my ultimate recipe to make a great pesto with a lovely consistency and a great wild garlic flavour. The first time I made this I used a really strong extra virgin olive oil as I thought that would be the best for a recipe like this. It really isn’t though, the olive oil was so strong, it really overpowered everything else in the pesto. So I recommend using a light olive oil to make this. 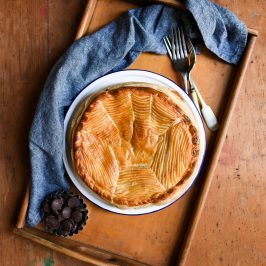 It gives a great consistency, but doesn’t alter the flavour and it’s a bit cheaper too. Which is great because Parmesan and pine nuts aren’t! 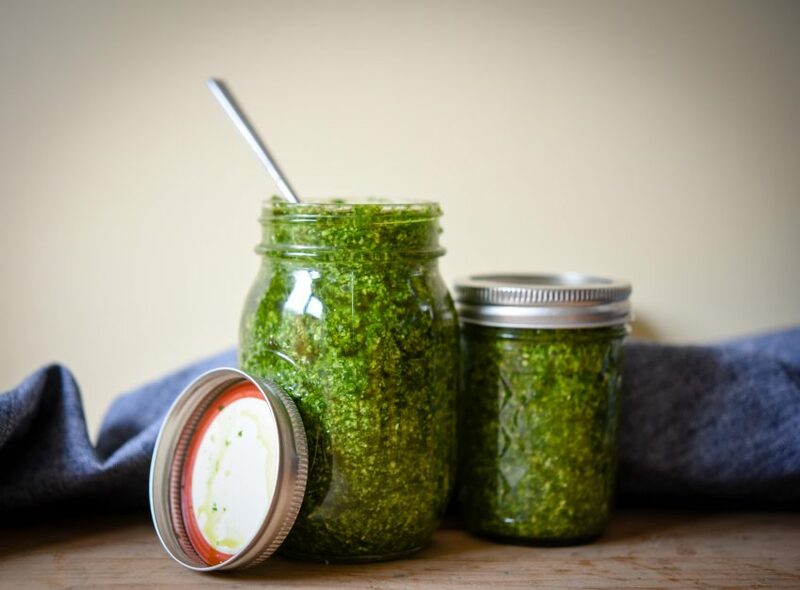 Here is my recipe for wild garlic pesto, it’s so easy and the recipe can be scaled up successfully, doubling/tripling the quantities where necessary. This is a recipe for wild garlic pesto, it's still around at the moment so grab some and make some of this delicious pesto. Place everything in a food processor and blitz until it forms a loose paste/pesto. The pesto is ready to be placed in sterlised jars. It can be stored in the fridge, just make sure the top of the pesto is covered in oil to help preserve it, if storing out of the fridge. 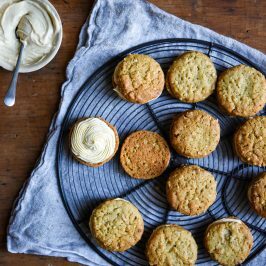 This recipe can be easily doubled if you have more wild garlic to use. You can use the pesto in so many things, obviously pasta, but it’s great with grilled meat, or a coating for fish mixed with some breadcrumbs, as well as stirring a spoonful into a bolognese. 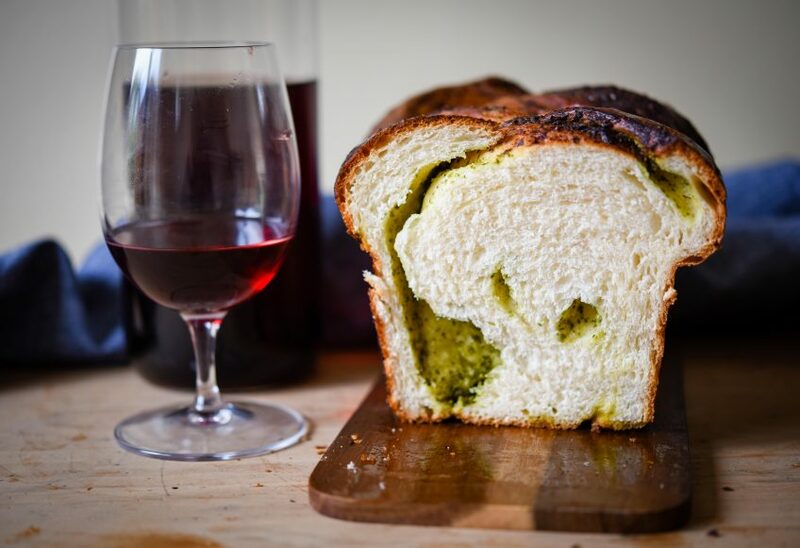 I have used the pesto to make a wild garlic pesto milk bread that is made using the tangzhong method. Prior to making this, I’d heard of tangzhong, but not experimented with it, or truly found out what it involved. Tangzhong is an Asian method of bread-making where a roux of water and flour is cooked together gently and then left to cool, before adding to a dough. The concept of mixing flour and water and then adding it to dough at a later date is often used to really help with the flavour and texture of your bread, from sourdough to creating a poolish to add to your bread dough. This bread is the lightest, fluffiest bread I’ve ever made and that is down to the Tangzhong and the milk in the bread, probably the most famous use of Tangzhong is in Hokkaido Milk Bread. 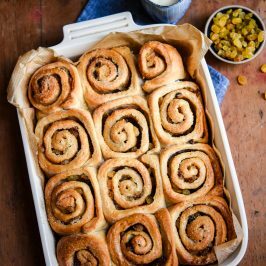 This would be a great bread method to use for making something like iced buns or other sweet bakes. This is a recipe for milk bread or pain au lait using the tangzhong method. 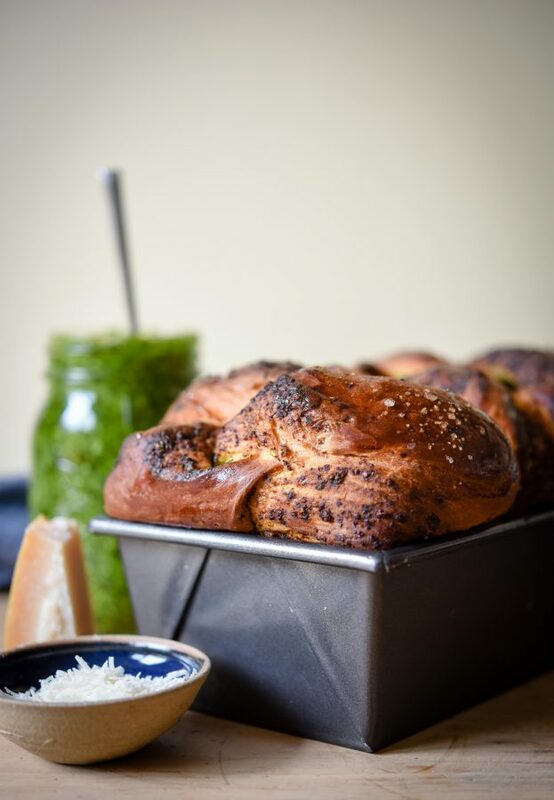 This produces a really delicious, fluffy loaf of bread that is perfect for dipping in oil or to enjoy on its own. Whisk the flour and water together in a small saucepan until smooth. Place over a medium/low heat and whisk constantly until the mixture has thickened to a paste that is gloopy. Scrape it into a bowl, cover with clingfilm directly on the surface to prevent a skin from forming and leave to cool to room temperature. To make the dough, place the flour in the bowl of your stand mixer, fitted with a dough hook. Add the yeast, salt, and sugar and stir gently to combine. Whisk together the cooled tangzhong, egg and milk in jug and add it to the dry ingredients. Mix everything together (on speed 2 if using a kitchenaid) for 5 minutes until it forms a smooth dough. Cover the bowl with clingfilm and leave to rise for 1-2 hours until well doubled in size. Alternatively, place it in the fridge to rise overnight. If you refrigerate it, the following day let it come up to room temperature for about half an hour before continuing. Once the dough has risen, punch it down and fold it in on itself a couple of times. Turn out onto a lightly floured surface, and roll it out to around 25cm by 40cm. Spread pesto all over the dough,use as much or as little as you like, the flavour can be subtle after baking, so I would use plenty, leave a strip at the bottom long edge of the dough which is bare. Brush this bare strip with a small amount of water. Starting from the long side away from you, roll up the dough tightly to make one giant log. Using a large sharp knife, cut the log of dough in half lengthwise, leaving about an inch of dough uncut at the top. "Braid" the two halves of dough together by simply putting one half over the other, then again and again. Pinch the ends together and gently transfer the loaf to the loaf pan. Loosely cover the loaf with oiled cling-film and leave in a warm, humid place to prove (but not over 24 C). Let it prove for 2½ to 3 hours, until the loaf has almost doubled in size. 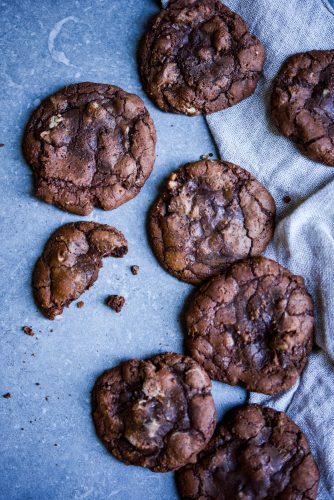 If you press the dough gently with a finger the indentation should spring back slowly but remain visible. If it springs back quickly it needs to prove for a little longer. Preheat the oven while the dough is rising to 180C/350F/gas mark 4. Brush the top of the dough with some of the beaten egg, be sure not to drag the pesto or ruin the braiding. Bake on the lower middle shelf of the oven for 30-40 minutes until well risen and the top of the bread has gone golden. The internal temperature should reach 94C on a probe thermometer. Cover the bread with foil partway through baking if it starts to get too dark. Transfer to a wire rack and leave to cool completely before slicing. Do you have any ideas of other ways to use wild garlic pesto? 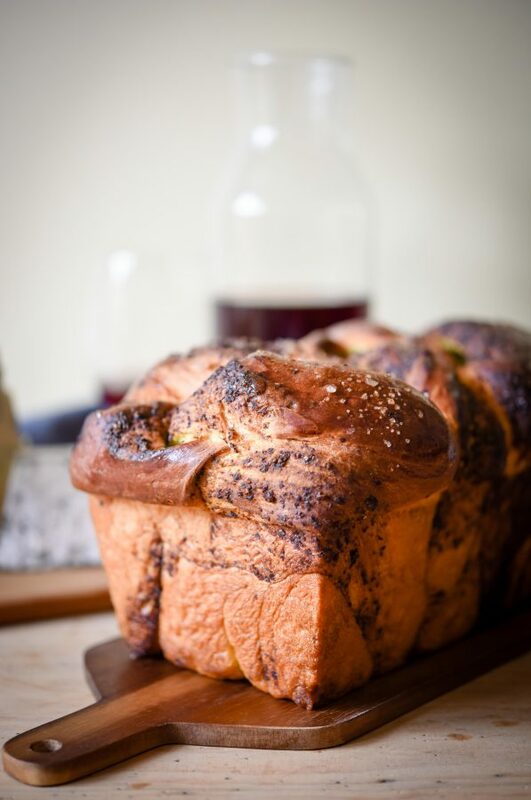 Have you made your own milk bread before? Let me know in the comments. This is delicious with green basil pesto, and just rolled, not braided. Thanks for the recipe! So glad the recipe served you well, your variations sound delicious. I’d love to see a picture. Oooh that’s a lovely idea Jodie, it was so good I didn’t do anything with it, except eat it by the slice. What a stunning bread dear Angela. The wild garlic pesto sounds very delicious and that colour is lovely. 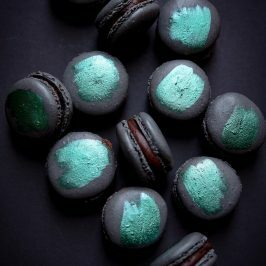 It is so delicious Sonali, the colour really is great isn’t it? 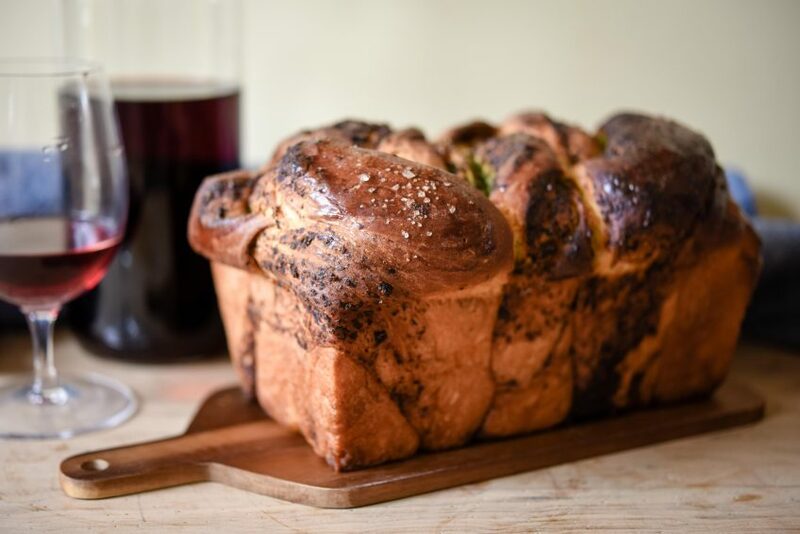 This is the perfect bread Thalia, you would love it, you have to make hokkaido milk bread, I can just imagine how beautifully you would style it. What a gorgeous loaf, Angela! Unfortunately we don’t have wild garlic here, but I would love to try it with “usual” pesto! Thanks for sharing! Thanks so much Anastasia! It would be just as lovely with basil pesto, I know how lucky I am to have wild garlic in abundance, I always stock up when it’s growing. This is such a great bread recipe. I was so impressed with how fluffy it turned out to be. You can use ordinary pesto if you can’t get hold of any wild garlic. Oh, I think this wild garlic pesto would be fantastic on gluten free pasta! Love the vibrant color of pesto and the flavors are just as vibrant and delicious! I’ve never made my own milk bread before, but this loaf is so gorgeous! It looks so light and fluffy! And the pesto running through it is a nice surprise! It would be really great, it has a strong flavour, but it’s not overpowering. It would be great in ravioli or tortellini too. This is the second time I’ve made milk bread and I think it might be my favourite kind of bread. I had no idea that jarred pesto would keep for so long in the fridge. Awesome! I’ve made an “exotic” pesto out of garlic scapes before, but never wild garlic: I’ll be giving this a try before all the wild garlic is gone! Such vibrant color! Yes I have a batch that I made last year that is in the fridge. As long as your jar is sterilised and the top is sealed with oil, I’ve found this keeps really well in the fridge. The oil sets, but you can just scrape this off and cook with the pesto below. The colour is amazing isn’t it? My goodness that looks absolutely AMAZING! I do know of a little patch of wild garlic on my remote little island. 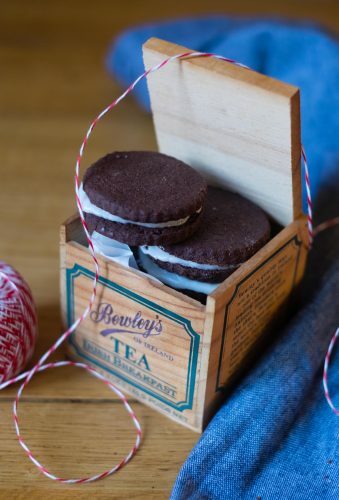 I’ll have to go check and see if there’s still some there and make this! 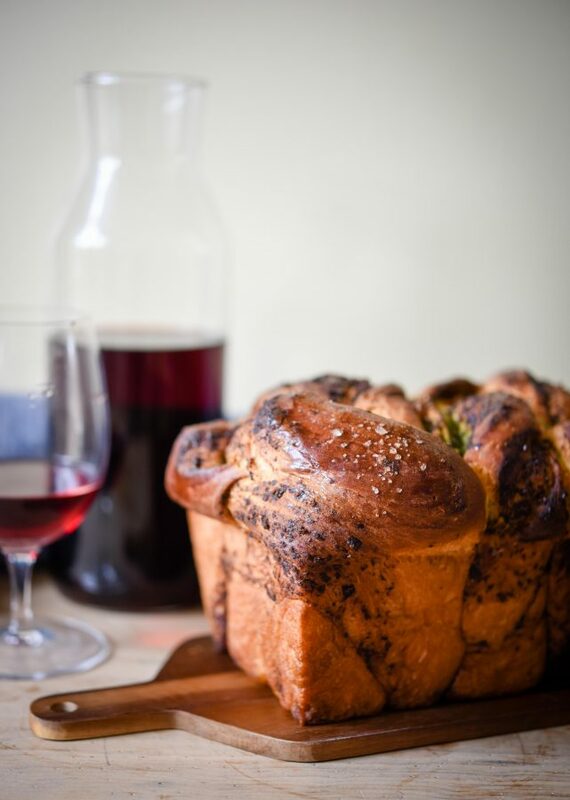 Definitely make this bread and the pesto is amazing in so many other dishes too! I just love wild garlic pesto! Never would have thought to adding it to a milk bread though. Genius! Finding a good fruity light olive oil is so important for pestos! yes Meeta you are so right about the olive oil and I made that mistake first time. 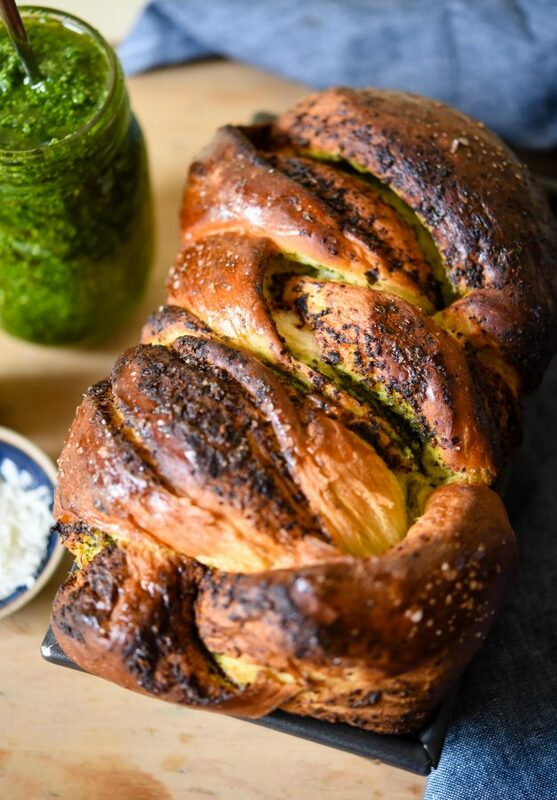 This is a great bread and the pesto is fabulous in it. This is simply great!!! I would like to know whether the long proving (2h to 3h) could made ahead, the day before, in the fridge. Then, how to proceed the morning after? Do you know if it freezes well? 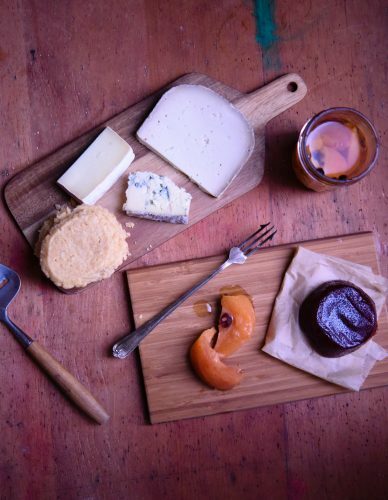 Have yout tried it with cheese or other ingredients, savoury or sweet? Thanks Silvia – you could prove the bread in the fridge overnight, but because this is quite a rich dough, I don’t think it would prove much in the fridge. I made my dough in advance and then let it come up to room temperature to prove. This does actually increase the proving time though as you need to wait quite a while for the dough to come up to room temperature. 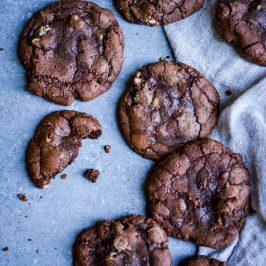 I haven’t tried a sweet version of this, but something like chocolate spread would work really well as you can increase the sugar up to about 60g – I reduced it from that amount in the original recipe because I didn’t want a sweet bread. 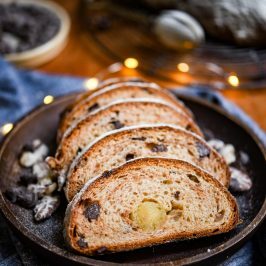 Here is a chocolate recipe, I haven’t tried it http://whattocooktoday.com/hokkaido-chocolate-milk-bread.html if you search Hokkaido Milk Bread, you should find a lot of useful stuff. I haven’t frozen this, but I think it would affect the texture a bit, so I probably wouldn’t freeze the cooked bread. This sounds incredible. I love how great the pesto stays, even after being baked into the bread! Yes it really hold it’s colour, the bread is so delicious too. I adore wild garlic and used Scottish Rapeseed Oil to make my pest with it. Your bread looks and sounds amazing. Not a method I’ve come across before. Isn’t it tasty Claire? Rapeseed oil is another great choice, I use that for all of my cooking. This is a great method of bread-making, definitely give it a try if you can. We’re supposed to be getting green garlic in our CSA today. Is it the same I wonder? I’ll have to read the guide you linked to. 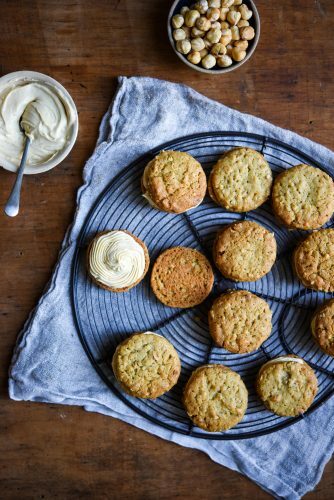 But I first wanted to say how lovely this recipe looks for this time of year when it is not too hot to bake, yet I’m craving fresh spring flavors. Thanks Hannah – you’re more than welcome your loaf looks amazing! I had to wander off the beaten track to find wild garlic, but there’s a patch not far from my house thankfully!